You may have heard of Norovirus–that mean little stomach bug that’s been know to spread its way around cruise ship. The Norovirus illness is sometimes referred to as “food poisoning” or the “stomach flu.” Although food poisoning can be caused by Noroviruses, from small particles that can get into your food, the truth is that other germs and chemicals can also cause food poisoning. 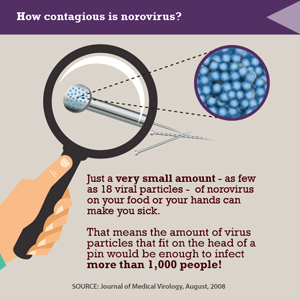 Norovirus is a very contagious virus that is transmitted from an infected person, contaminated food or water, or by touching contaminated surfaces. The virus causes your stomach, intestines, or both to get inflamed (called acute gastroenteritis). This leads to stomach pain, nausea, diarrhea and vomiting. Anyone can be infected with Norovirus, and you can have the Norovirus illness many times in your life. Norovirus illness can be serious, especially for young children and older adults. Wash you hands carefully, especially after using the bathroom, changing diapers, and always before eating, prepping, or handling food. Since Norovirus can stay active in your system for up to two weeks after you have recovered, it’s important to keep washing hands thoroughly to prevent it from spreading to others. Wash fruits and vegetables and cook seafood thoroughly. When you are sick, do not prepare food or care for others. Clean and disinfect contaminated surfaces. Use a chlorine bleach solution with a concentration of 1000–5000 ppm (5–25 tablespoons of household bleach [5.25%] per gallon of water) or other disinfectant registered as effective against norovirus by the Environmental Protection Agency (EPA). Wash laundry thoroughly. Immediately remove and wash clothes or linens that may be contaminated with vomit or stool (feces).